A new website has been started to include all those items and topics that have occurred since Chance Additions was published. Aqualux has finally been photographed; the Flora pressed glass range is photographed; more on the Fiesta Glass and Joseph Joseph range; more ephemera. And it will keep on growing – already 120 brand-new photos and counting. Go to Chance Glassware for more details! Phew! Chance Additions finally here! After some seven years since Chance Expressions was printed, the long-awaited sequel is now shipping, go to the Cortex Design website to order. 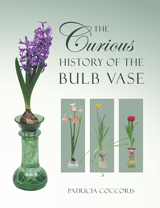 A new book by Patricia Coccoris on the fascinating 300 year history of the bulb vase. Fantastic for collectors, growers, researchers or historians - something for everyone! See Cortex Design for details on how to purchase, and the HyacinthBulbVases.com web site for more details of the book. I was saddened to learn of David Watts' passing last December. His knowledge on glass - particularly the technology side - was amazing and his book, A History of Glassmaking in London (see his website) a seminal piece of research. After contacting his son, Ben, I decided to publish the eulogies and obituries. All are in PDF form. Laura was appointed as archivist to Sandwell, although sadly her tenure has now finished. But in her short time there she managed to organise 300 boxes of papers and 400 ledgers dating from 1824–1980. So you think you know all about Swirl? Think again. There is so much disinformation written about Swirl, with this being perpetuated through the internet, I have decided to publish pages 86 and 87 from Chance Expressions to (hopefully) dispel these totally false and highly misleading attributions. Let me make it clear: there is absolutely no proof that Margaret Casson or Robert Goodden designed this enigmatic pattern. Instead, read my findings and draw your own conclusions. This is a totally free, press quality PDF, about 3.5MB in size. 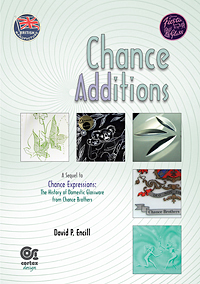 Another free download which lists all the errata and updates that can be applied to Chance Expressions. Again, this is a freely downloadable file, about 700KB in size. Note: Since the original upload, this version, published 15th February 2010, contains an amendment. Since Chance Expressions was published a lot more information has surfaced. Enough, in fact, to fill a booklet which will be produced shortly. A 122 page publication, A4 in size (297 x 210mm), with the usual lashings of photographs in full colour - over 650 to be precise, that's over five photos per page! See here for a full feature list and for other books! If you are looking for that elusive piece of Chance Glass, then please contact me. 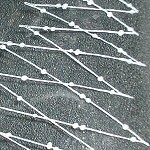 While I cannot promise that the rarest items are available, there is a good 'chance' I will have a shape or pattern that might just help. Far too much to list, so please just mail your request. With thanks to everyone from GlassMessages.com who helped identify and contributed their examples. 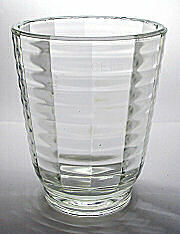 The history of the domestic glassware produced by Chance Bros. is extensive. Massive in fact: enough for two books! But here are a few highlights. 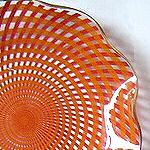 The first domestic glassware produced by Chance was 'Orlak'; a range of heat-resistant ovenware and tableware designed by Harold Stabler, who was better known as part of Carter, Stabler & Adams partnership, that later became Poole Pottery. Some ovenware is identifiable as being octagonal-shaped with recessed handles on the lid. The orange enamel decoration on	the	example	shown (right) is not generally known. Production started from 1929 to 1933 before Chance sold the rights to Jobling, who were at this stage manufacturing Pyrex and probably purchased Orlak purely to stifle the competition – whatever the circumstances, Orlak never reappeared. Chances' first foray into tableware. Heat-resistant. Prior to Fiestware, Chance were major producers of quality pressed domestic glassware that	including bowls, jugs and vases, and were developed	with	intriguing and exceptional optical	characteristics. Seven designs were created from 1934 and these	continued	until 1953 in a variety of shapes	and styles, when	the	manufacturing process	proved	uneconomical and was ceased. The predominant feature of Chance pressed glass from this era is it's all created from clear glass. 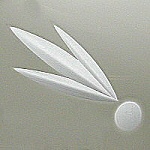 Examples shown in colour are actually enamel sprayed onto clear glass. With the advent of 2006, Chance's most popular creation, Fiestaware, has now reached 'Vintage' status throughout the entire range! Fiestaware was Chance's most	successful	creation: mass-produced	glassware for the domestic market that stood the test of time over a period of thirty years. This glassware	was produced flat-rolled sheet glass with decorative	screen- and transfer-prints	applied	prior to	it being formed to shape, by reheating and slumping. Their most popular creations were from	the	'Fiestaware' range that eminent designers like Michael Harris and Margaret Casson (neither of whom designed Swirl!) helped create, with the most popular designs being Swirl (1955 — see 50th Anniversary page),	Calypto (1959,	Harris)	and	Lace. One well-known and highly collectable pattern, is	Margaret Casson's	'Night Sky' (1957). 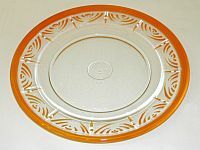 Fiestaware was often finished with a	gilt	rim,	but this is not	always the case, and while the common dove-grey (often called white) silk-screen-transfer on	clear	glass	is seen as the	norm, in fact	there are many other variations;	for example green, black and gold transfers on clear glass and gold transfers on ruby-flashed glass can be found. Additionally, Chance Brothers produced a wide range of 'Crestware' (items containing the names of towns, for example) and a wide range of 'Floral' ware (produced between c.1961-81). The use of silk-screen and transfer printing as the design medium had another advantage; using regular production lines for the glass blanks, Chance	could	create new designs quickly to cover special commemorative events, like the Queen's Silver Wedding in 1977. The commercial side was also exploited successfully and 'Adware' became a popular way for salesman to leave their customers a	permanent reminder: more often than not,	this took the shape	of a dish/ashtray. 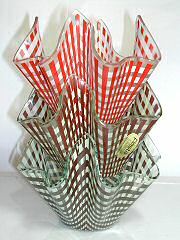 An unusual serviette holder in the familiar 'Swirl' design, but which was not made by Chance! An entire subset of the Fiestaware range; these	vases represented a bewildering array of	sizes,	patterns	and colours. If all these combinations were used up, you'd probably be looking at	well over 500 different vases to collect! However, we estimate there are	'only' around 150 different varieties. All images on this site are copyright of the site, ChanceGlass.net. If you wish to use any image, please contact us first! All data on this site is provisional	until confirmed. If you do use information from this site, it would be nice to be	acknowledged! 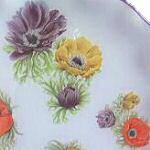 The absence of any pattern from this site does not indicate rarity — it could just mean another manufacturer	made it...! Avoid using the term 'RARE'. Much of the less common items should be termed 'SCARCE'. Very little Chance glass is truly rare. Chance Brothers operated exclusively from Smethwick, England, from 1824 until 1981 when flat glass production was absorbed into the parent	company's	plant (Pilkington) at St. Helens. 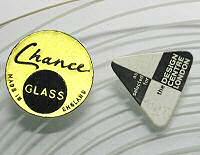 Chance Brothers was one of the leading lighthouse, scientific and optical glass producers in	the	world. Also note our Copyright With thanks to: Broadfield House Glass Museum and Smethwick Heritage Centre.